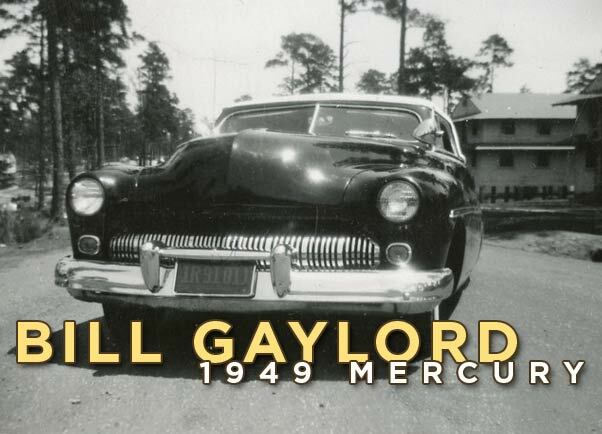 In 1949 Bill Gaylord gets a 1949 Mercury Convertible which George Barris chops right away. Its the first ever chopped 1949 Mercury Convertible. 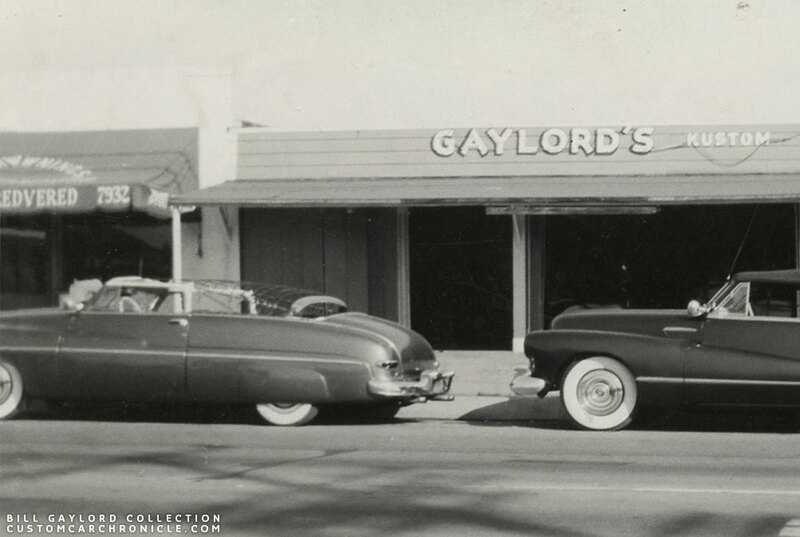 In the later part of the 1940’s William (Bill) Gaylord Lunney was working closely with the Barris Kustom Shop. Even though the Barris Shop had always had tight bonds with the Carson Top Shop, George Barris saw possibilities in working together with Bill. It started when George Barris was not happy about the way the Carson Top Shop did the padded tops on the 41 Ford. George wanted to have a more flowing line on the rear of the top. 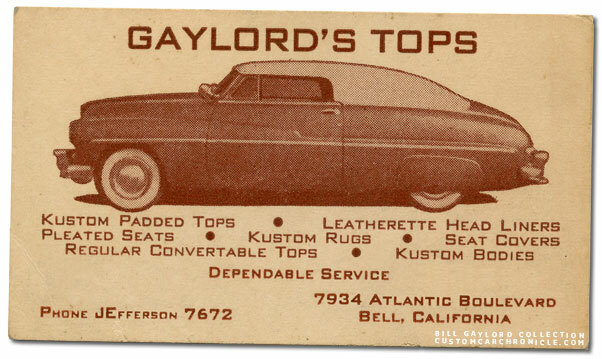 He went to Bill Gaylord and together they found out a way to make the padded tops on the 41-48 Fords flow much better. George was very happy about the result an the two started trading work, and send cars to each others workshop to let the other do their thing. They even joined some advertising space in Motor Trend together. First when the Barris shop was still located in Bell, and later when the Barris shop had moved to its famous Atlantic Blvd shop… close by Bill’s shop who was also had his shop on Atlantic Blvd. Some of the ads that ran in late 1949-early 1950 issues of Motor Trend magazines where Barris and Gaylord worked together. 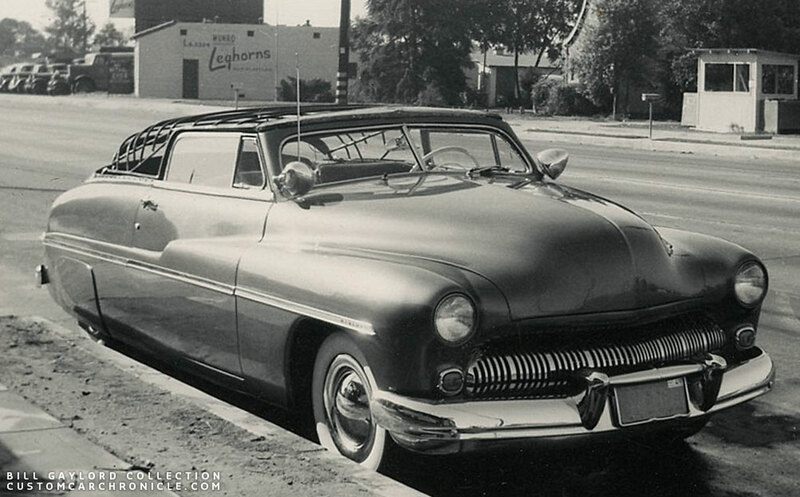 The story on Bill’s ’49 Mercury started in early 1949. Bill had a very nicely done ’42 Mercury convertible with front sheet metal from a ’47 Mercury. It was a really nice late 1940’s style custom with chopped windshield shaved handles, nosed, decked and one of Bill’s nicely flowing padded tops. Bill took is ’42 Mercury custom to a local Mercury dealer and traded it for a new ’49 Mercury convertible. The Mercury dealership put the ’42 in their best spot in front of the showroom and it sold very fast. Soon after that they asked if Bill could do another one for them and sell it the same way. He created another custom, with a George Cerny chopped windshield. It also was sold very fast. Bill with his ’42 Mercury that he later traded for a new ’49 Mercury convertible. Magazine ad for the new ’49 Mercury convertible. 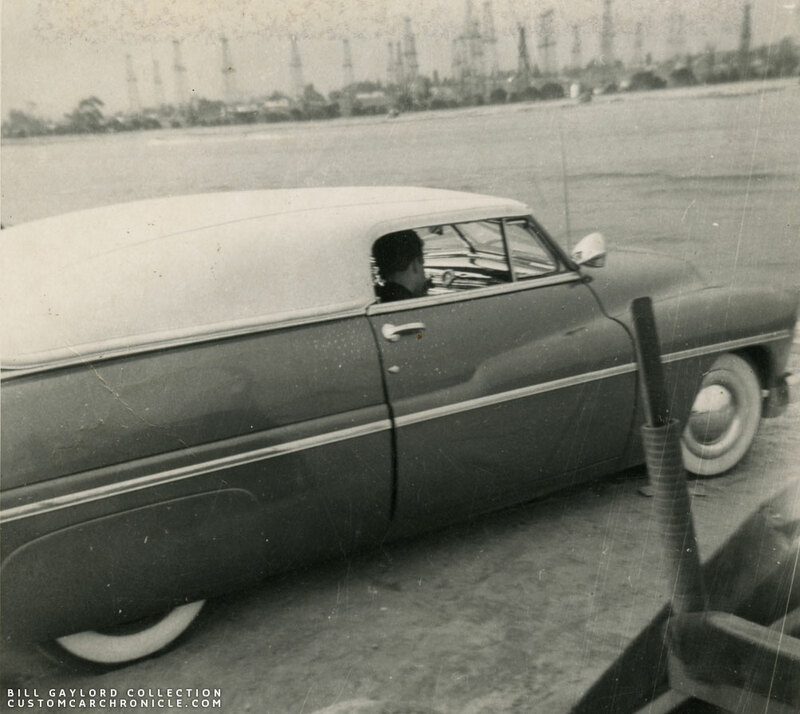 Bill had his new ’49 Mercury and at the same time George Barris came over asking Bill if he could create a long low padded top for his personal ’42 Cadillac (with 47 fenders). Sure I can do that Bill mentioned. 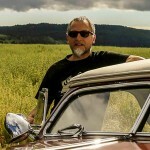 If you chop the windshield on my Merc, french the headlights and remove the emblems… deal! 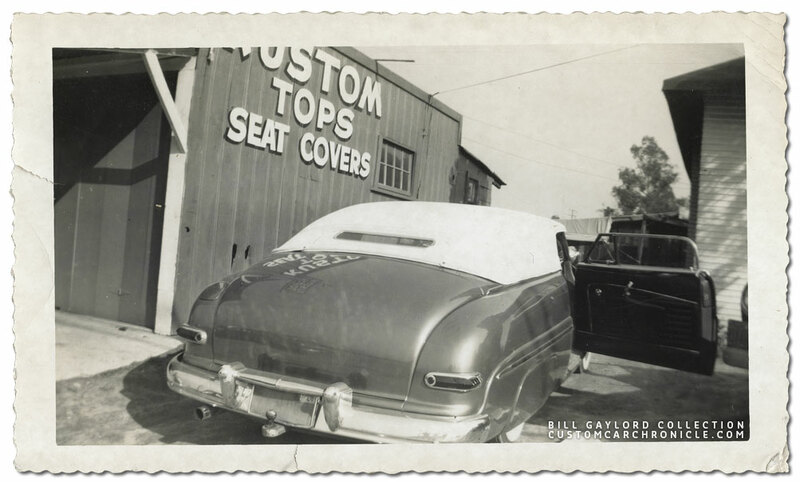 So Bill created the long and smooth padded top for George Barris his’42 Cadillac, while George was busy chopping the windshield of Bill’s new ’49 Mercury. George also removed the hood emblems, peaked the hood and molded the grille surround to the front fenders. The trunk was shaved and the suspension was lowered. George extended the bottom of a set of ’49 Mercury accessory fender skirts and when all the work was done the car was painted a lime green color. “The lime green they used back then.” according to Bill. All this was done in 1949, and most likely Bill Gaylord’s ’49 Mercury was he very first ’49 Mercury convertible that was ever chopped. 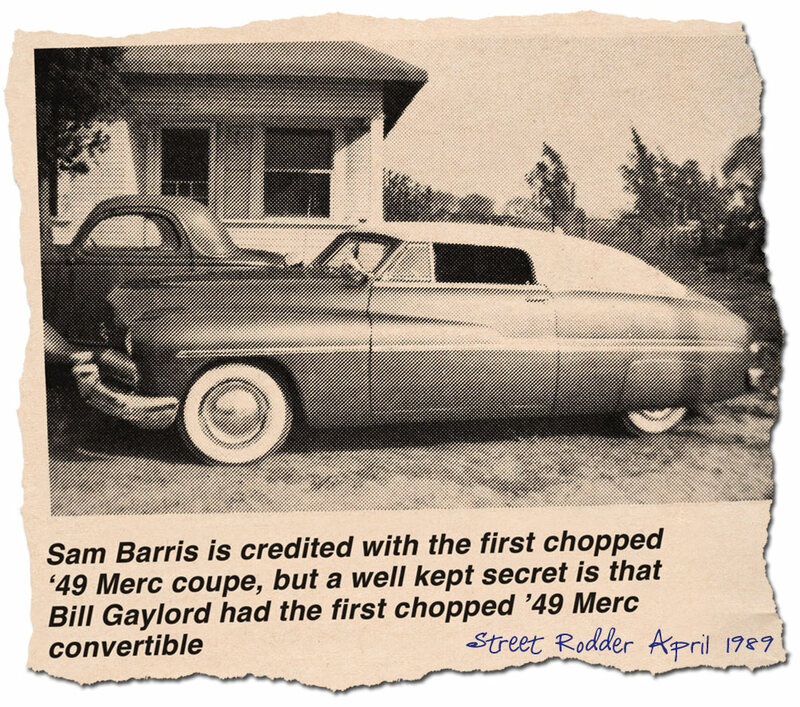 If you want to know more about the first chopped 49-51 Mercury’s, be sure to check out the CCC-article we did on this topic. 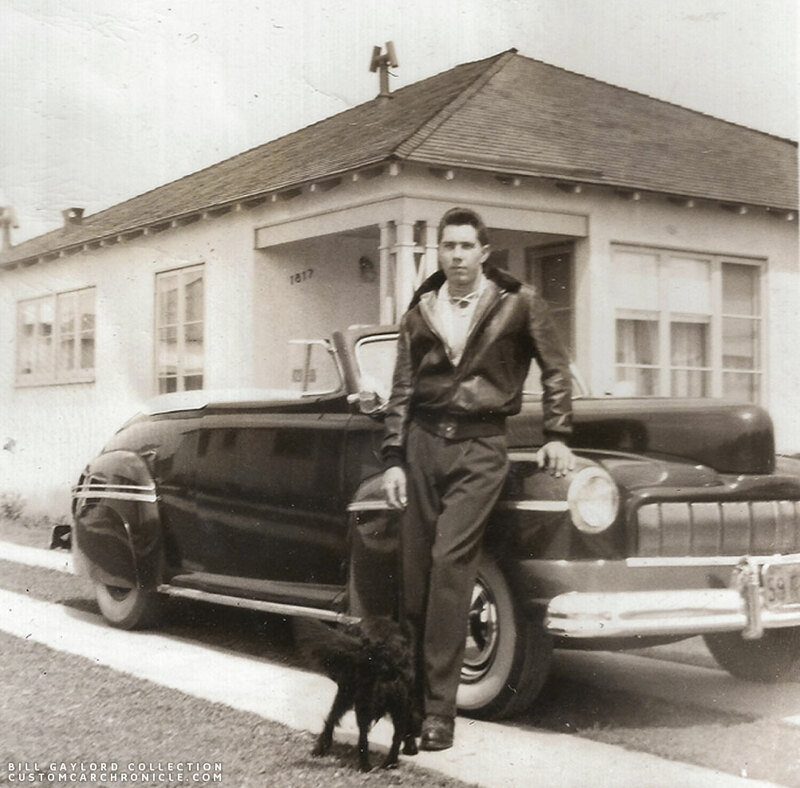 A young Bill Gaylord proudly showing of his freshly chopped ’49 Mercury Convertible. This photo gives a good look at the extended down Mercury fender skirts and the very rare round beauty rings Bill Used. 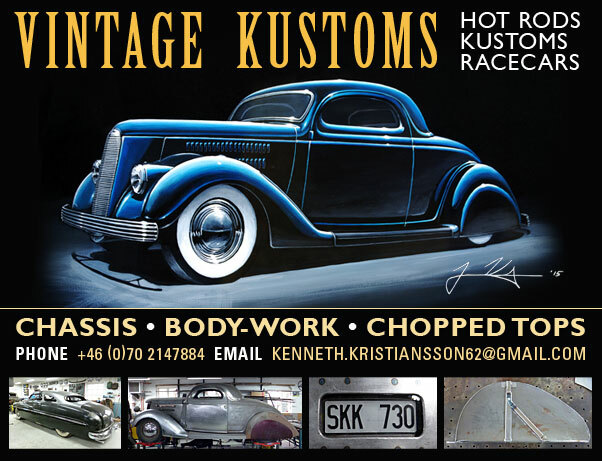 The same units were used on the Barris Kustoms restyled Snooky Janich ’41 Ford. Besides being a car guy Bill also love the water and boats, speed boats. So when time allowed he spend his spare time at the lakes with his boat pulled by his ’49 Mercury. 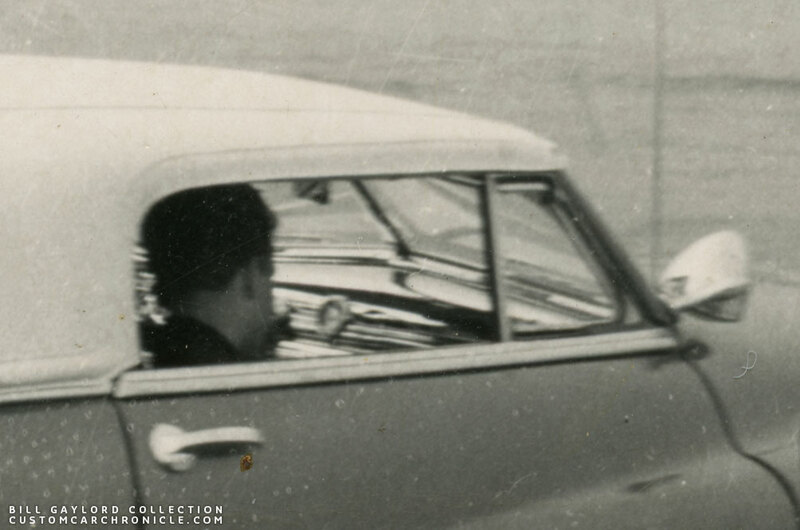 Note the ’49 tag on the license plate. Bill took out the stock ‘Mercury dash board, smoothed it and send it to the chrome plater to be completely covered in bright shiny chrome for a really special effect. He drove the car for a little bit before he had time to get to work on the top. The interior for this lime green version was done in brown. Bill always liked the filled in rear quarter window look on the padded tops, especially if the flow of the rear of the top was very smooth. He decided to create this kind of top for his personal ’49 Mercury. The top he created was very similar in style in what he did on the 41-48 Ford’s and Mercury convertibles. Bill also created some very handsome door window channels from Aluminum channel with a wonderful round rear corner to match the padded top. 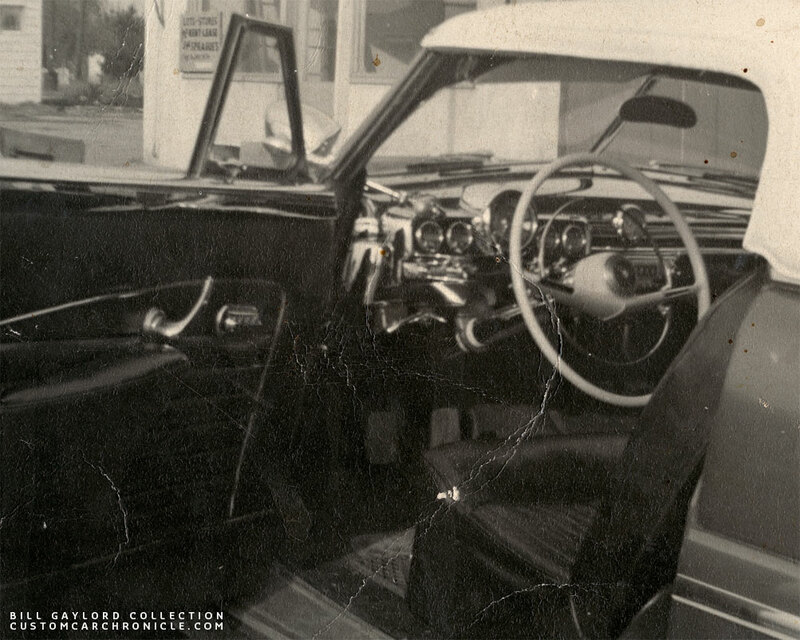 Bill later added an red all leather interior with beautiful tuck & roll panels, and to top of the chrome plated dash he bought a brand new Monterey Accessory steering wheel which gave the car an even more luxurious feel. 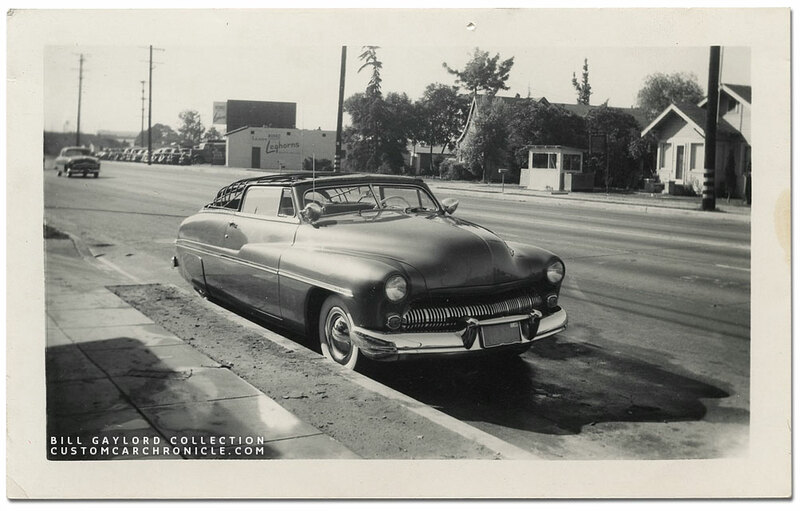 The earliest photo in Bill’s collection of the Mercury with the padded top being constructed in this one taken in front of the Gaylord shop. Ben Mario’s Barris restyled Buick is parked behind it. Bill would later add a padded top to Ben’s Buick after the windshield had been chopped. This photo, also taken in front of the Gaylord shop, but facing the other side shows Bill’s Mercury a little later. The frame and door window channels now have all been finished and the padding and canvas were up next. 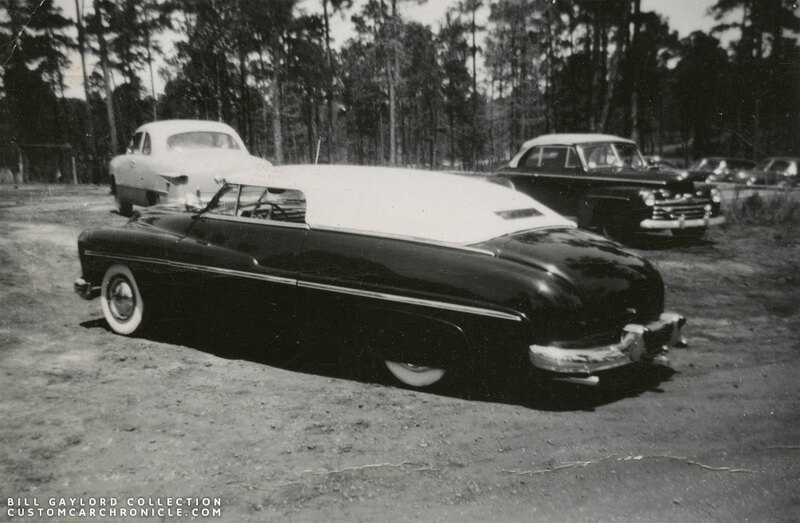 These photo show that Bill used his Mercury as daily driver, even during construction of the top. Enlarged section of the previous photo shows a little more details. Frenched stock headlights, molded in grille surround, peaked hood, center bar removed from the stock ’49 Merc grille. 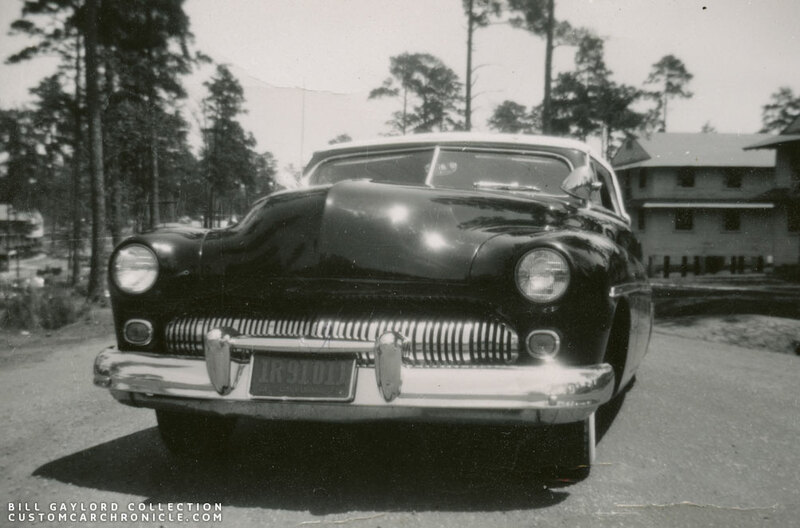 Bill liked his ’49 Mercury so much he decided to use a side view photo of the car for his Business Card in late 1949. The Padded top Bill created for his mercury was uniquely styled with very long sides and a very small rear window. It must have been rather hard to drive it around in busy Los Angeles. 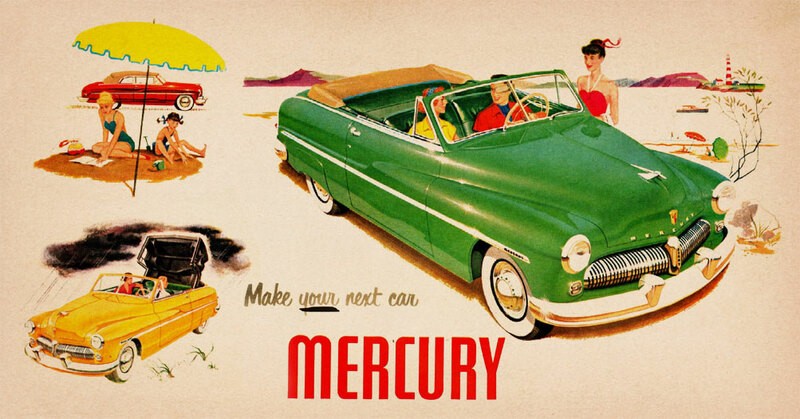 Most of the mercury convertibles with padded tops created after this one had a different stye of padded top, with the rear quarter windows in place and a more square rear portion of the top where the rear window was more upright which also gave a better rear vision when driving. This later style must have been an improvement when driving these cars on the road for the driver, and most certainly for the passengers. Parked next to Bill’s shop building we can see the window channels Bill created, and we can also see that the first version of the Merc has stock taillights, and the hitch for taking Bill’s boat to the lake. Better look at the window channel with the nice curve on the rear corner. The ’49-51 Mercury convertible come with straight corners on the window channels, and curved units on the rear quarter windows. 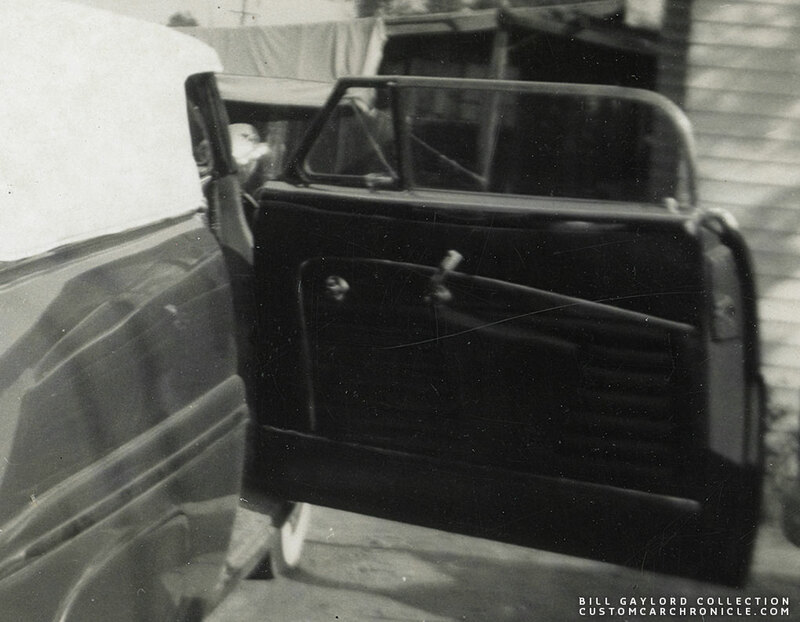 But since Bill eliminated the rear quarter windows he added the curve to the door frames. A look inside reveals the full chrome plated dashboard, the Mercury Monterey accessory steering wheel, and the very subtile red leather tuck & roll upholstery. Enlarged section shows the dash and steering wheel a bit better. 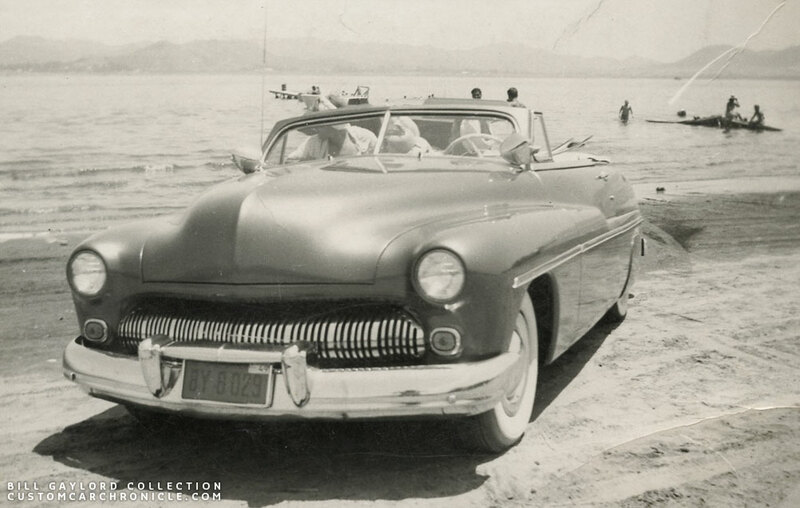 Another photo of Bill’s Mercury at one of the lakes he used to go to with his boat. Cropped section shows the chrome plated dash a little better. 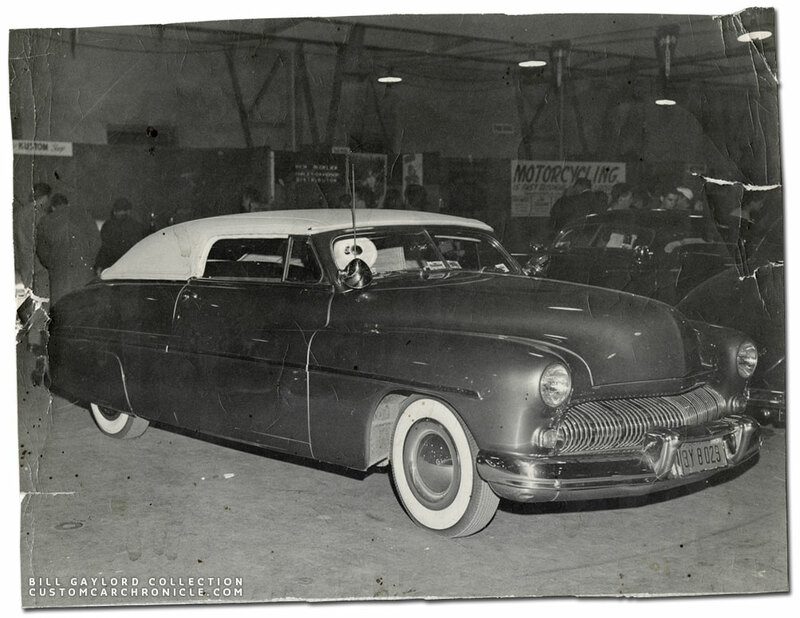 Bill’s ’49 Mercury at an unidentified indoor car show in 1949, perhaps early 1950. 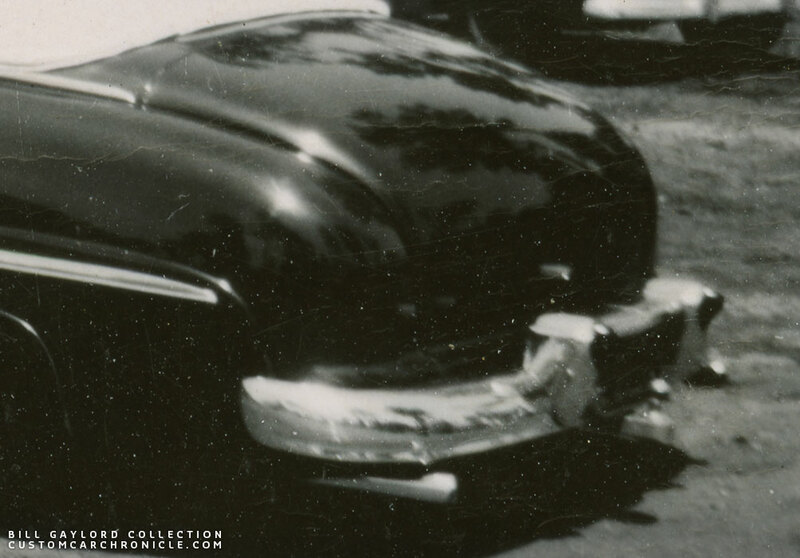 It looks like the Jesse Lopez ’41 Ford could be sitting behind Bill’s Merc. Share by Ross from 46-64 HighSchool Yearbooks. 1950 Bell High yearbook. 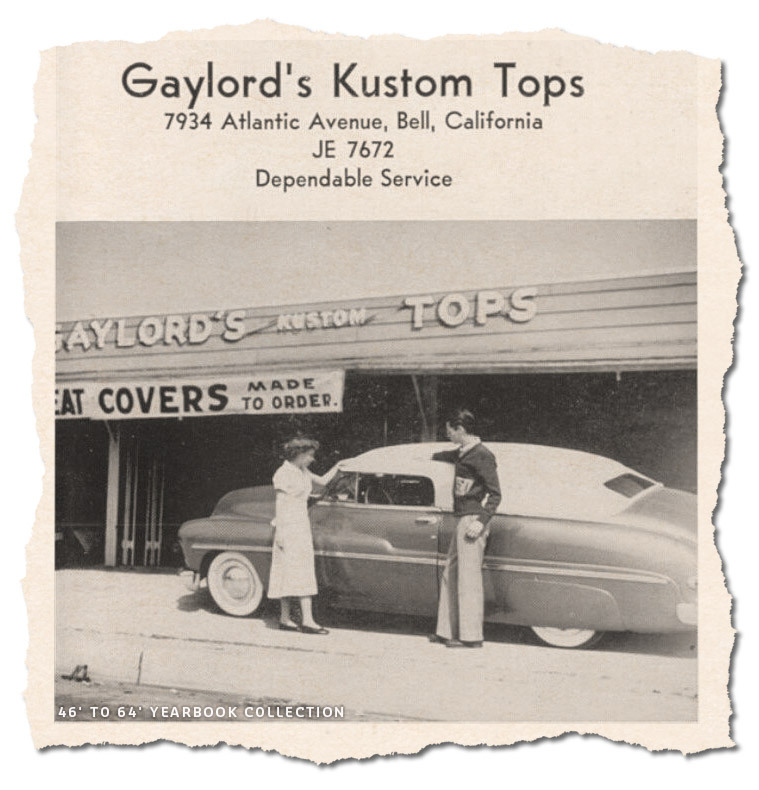 Ad for Gaylord Kustom Tops. Somewhere in 1950 George Barris shaved the door handles and locks, removed the Mercury taillights, filled the holes and re-painted the car in a deep maroon. The new color gave the car a completely different look, mean look. Barris Kustoms also reworked the stock 1949 Mercury rear bumper guards. They removed the bullet section of the guards and hand shaped clear red lucite to create a set of very unique bumper guard taillights. Bill enjoyed the car for some time, but never as much as he had hoped he would, simply because he was called away to serve the Army. Just at a time the combined ads with Barris were starting to bring in extra clients he was shipped to Germany. It was frustrating for Bill to be in Germany and get the latest issues of Motor Trend magazines shipped and see the Barris Gaylord ads in the magazines. Knowing Barris was getting all the work from them, but he could do nothing. Bill had left the car with his wife and later instructed her to try and sell the car. One day a guy came over to buy the car. He was very serious about it and later explained to Bill’s wife that he needed to have the pink slip in his name so that he could get a loan for the car at the bank. The pink slip was handed over, he drove off with the Merc and nobody ever heard from the guy, nor the Mercury. When Bill returned from his stint in the army he worked hard to get his business back on his feet, and he never heard anything about his beautiful ’49 Mercury convertible again. Who knows, perhaps the car is still out there, further customized over the years, being driven around by somebody who has no idea the car might be the very first chopped ’49 Mercury, worked on by Custom Legends George Barris and Bill Gaylord. Or it could be long gone. If any of the readers knows anything more about the Mercury, please let us know. Shorty before Bill has to leave for his stint in the Army George Barris shaves the door handles and stock taillights, and paints the car in deep maroon. Close up of the rear shows the complexed shaped bumper guard taillights in the last version of Bill’s Mercury. These were also created by the Barris Kustom Shop. The new dark maroon paint job gave the car a quite different look than the green early version. The two maroon version photos were taken shortly before Bill was shipped to Europe and the car now has 1951 License plates on it. Bill’s ’49 Mercury never had any magazine exposure when Bill owned the car. Mainly because the car was around very shortly as a completely finished custom before Bill had to leave for his Army duties. Also because soon after Bill left for Germany, the car was stolen, and magazine exposure would sure lead to the person who took the car. Also around 1950, not many magazines featured Custom Cars, and there were a lot of cars to choose from. But in some more recent articles about Bill Gaylord the Mercury was mentioned. 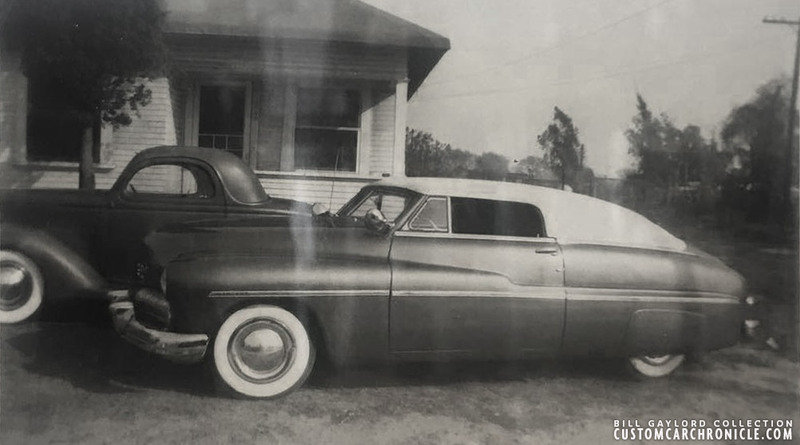 In the Jerry Weesner article on Carson Tops in Street Rodder magazine April 1989 Jerry shared a few photos from Bill’s photo album, and one one of the photos showed Bill’s ’49 Mercury sitting next to Bill’s home. 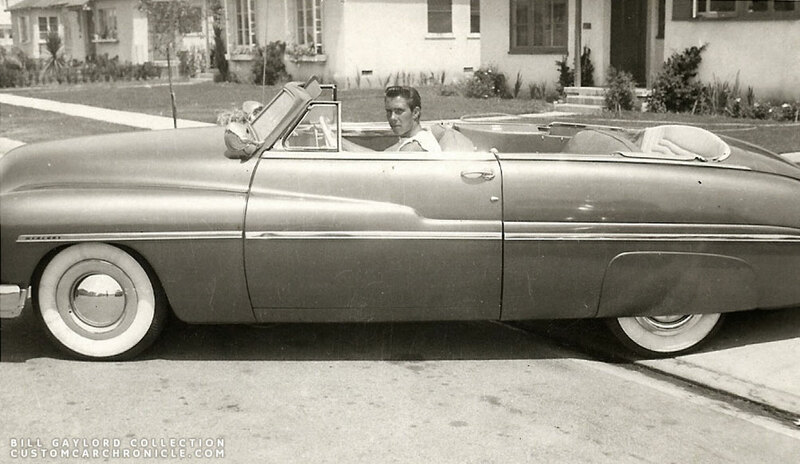 It mentioned that Bill’s Mercury was the first ever chopped 49 Mercury convertible. 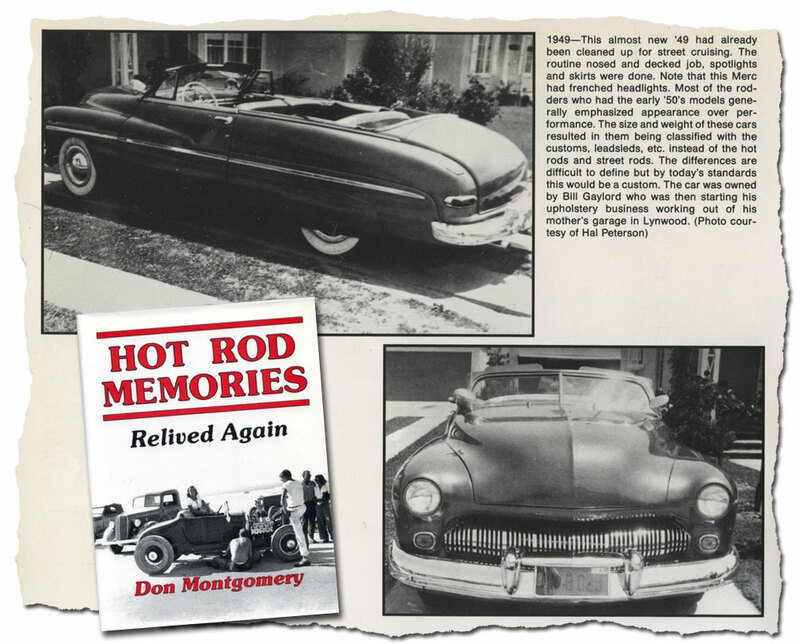 In the 1991 published Hot Rod Memories by Don Montgomery there are two 1949 photos shared from the Hal Petersen collection showing Bill’s Mercury. 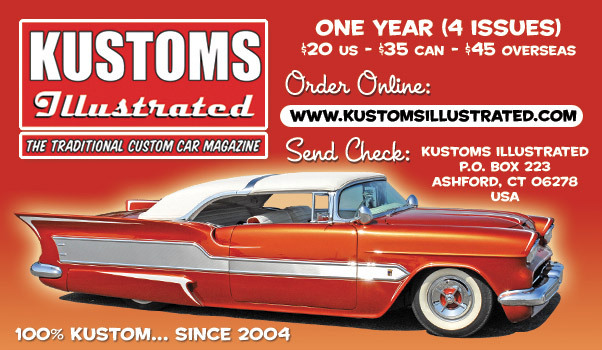 And in Kustoms Illustrated magazine issue # 35, fall 2012 there are several photos used in part one of the Bill Gaylord story. From the April 1989 Street Rodder Jerry Weesner article on Carson Tops. From the Hot Rod Memories book by Don Montgomery. If you want to read more about the history of Bill Gaylord, then you have to get Kustom Illustrated issues 35, 36 and 38. It has the most complete Bill Gaylord history story based on interviews and Bill’s personal photo albums in a three part story. Special thanks to Luke Karosi, Jeff Neppl and Bill Gaylord. Those photos are priceless, but to learn the stories behind them.. can’t even be measured. It just opens up a window to peek in on those times, with legends we only dreamed to meet. So glad to have Memo share his experiences. Those times! 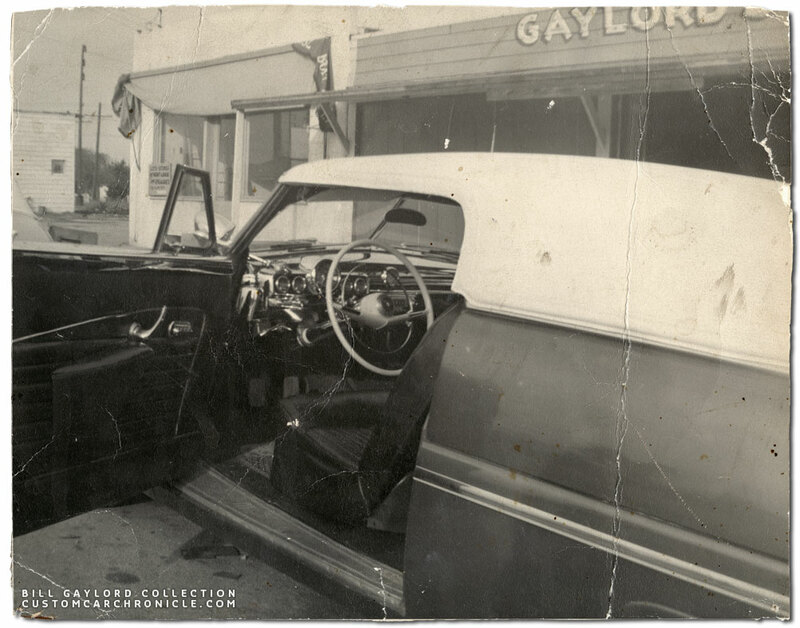 Another great look into a time long gone……..
Didn’t the Gaylord shop have a custom shop truck as well.? Any pics of that Rik?